It looks like this year big brands have discovered the lowly holiday sweater, and have made it a part of their marketing campaigns leading up to Christmas. First out was Coke Zero’s Sweater Generator contest, where fans could create a mockup of a holiday sweater using the online tool. The 100 sweaters with the most votes will be produced and awarded to their creators just in time for the holidays. 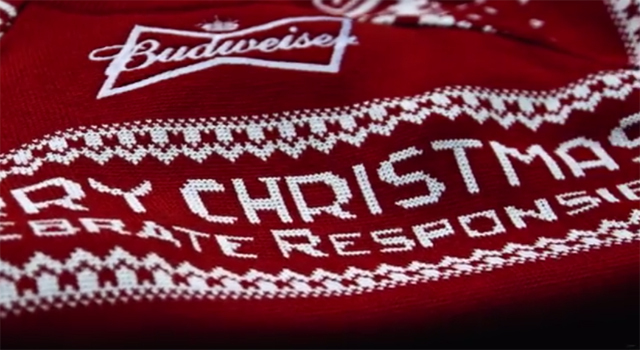 Budweiser UK has launched a seasonal sweater-themed promotion in support of designated drivers. The brand is using Knitbot, a Twitter-powered knitting machine that responds to tweets that include the hashtag #jumpers4des. The Knitbot will work around-the-clock for 10 days (November 26 to December 10) creating the red sweaters that include images of the Budweiser’s iconic Clydesdale horses. On December 11, designated drivers in the UK can apply on the Budweiser UK Facebook page for a chance to win one of the creations.